Liquidity risk management : a practitioner's perspective / Shyam Venkat, Stephen Baird. By: Venkat, Shyam, 1962- . Contributor(s): Baird, Stephen, 1966- [author.] . Introduction / Shyam Venkat and Stephen Baird. 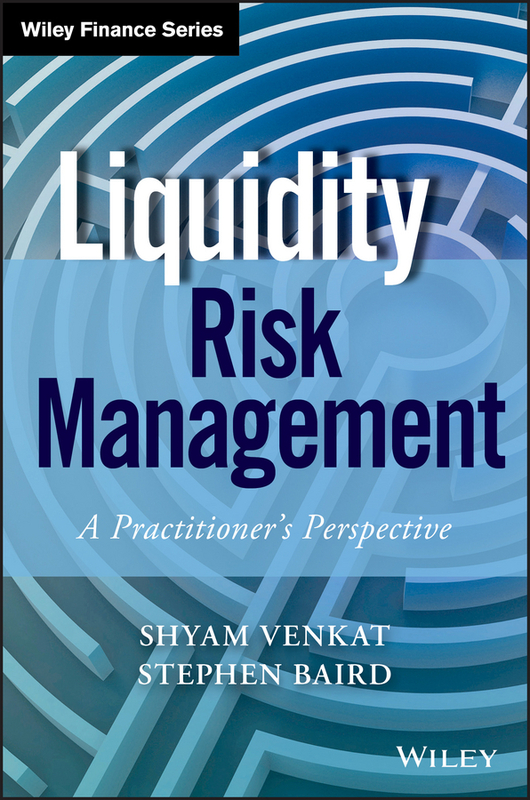 A new era of liquidity risk management / Shyam Venkat. Liquidity stress testing / Stephen Baird. Intraday liquidity risk management / Barry Barretta and Stephen Baird. The convergence of collateral and liquidity / Thomas Ciulla, Bala Annadorai, and Gaurav Joshi. Early warning indicators / Bruce Choy and Girish Adake. Contingency finding planning / Chi Lai and Richard Tuosto. Liquidity risk management information systems / Saroj Das, Shyam Venkat, and Chi Lai. Recovery and resolution planning- liduidity / Pranjal Shukla and Daniel Shanks. Supervisory perspectives on liquidity risk management / Kevin Clarke. LCR, NSFR, anf their challenges / Claire Rieger and John Elliott. Strategic and tactical implication of the new requirements / Hortense Huez. Funds transfer pricing and the basel III framework / Stephen Baird, Bruce Choy, and Daniel Delean. Liquidity and funding disclosures / Alejandro Johnston. Summary: "The most up-to-date, comprehensive guide on liquidity risk management--from the professionals Written by a team of industry leaders from the Price Waterhouse Coopers Financial Services Regulatory Practice, Liquidity Risk Management is the first book of its kind to pull back the curtain on a global approach to liquidity risk management in the post-financial crisis. Now, as a number of regulatory initiatives emerge, this timely and informative book explores the real-world implications of risk management practices in today's market. Taking a clear and focused approach to the operational and financial obligations of liquidity risk management, the book builds upon a foundational knowledge of banking and capital markets and explores in-depth the key aspects of the subject, including governance, regulatory developments, analytical frameworks, reporting, strategic implications, and more. The book also addresses management practices that are particularly insightful to liquidity risk management practitioners and managers in numerous areas of banking organizations. Each chapter is authored by a Price Waterhouse Coopers partner or director who has significant, hands-on expertise Content addresses key areas of the subject, such as liquidity stress testing and information reporting Several chapters are devoted to Basel III and its implications for bank liquidity risk management and business strategy Includes a dedicated, current, and all-inclusive look at liquidity risk management Complemented with hands-on insight from the field's leading authorities on the subject, Liquidity Risk Management is essential reading for practitioners and managers within banking organizations looking for the most current information on liquidity risk management"-- Provided by publisher. "The most up-to-date, comprehensive guide on liquidity risk management--from the professionals Written by a team of industry leaders from the Price Waterhouse Coopers Financial Services Regulatory Practice, Liquidity Risk Management is the first book of its kind to pull back the curtain on a global approach to liquidity risk management in the post-financial crisis. Now, as a number of regulatory initiatives emerge, this timely and informative book explores the real-world implications of risk management practices in today's market. Taking a clear and focused approach to the operational and financial obligations of liquidity risk management, the book builds upon a foundational knowledge of banking and capital markets and explores in-depth the key aspects of the subject, including governance, regulatory developments, analytical frameworks, reporting, strategic implications, and more. The book also addresses management practices that are particularly insightful to liquidity risk management practitioners and managers in numerous areas of banking organizations. Each chapter is authored by a Price Waterhouse Coopers partner or director who has significant, hands-on expertise Content addresses key areas of the subject, such as liquidity stress testing and information reporting Several chapters are devoted to Basel III and its implications for bank liquidity risk management and business strategy Includes a dedicated, current, and all-inclusive look at liquidity risk management Complemented with hands-on insight from the field's leading authorities on the subject, Liquidity Risk Management is essential reading for practitioners and managers within banking organizations looking for the most current information on liquidity risk management"-- Provided by publisher.